Rabbit is considered to be a specialty meat in the United States, but it was commonly consumed during the mid-20th century as a wartime food. Rabbit meat is eaten in various other countries as well, including Malta, France, Italy and China. This meat is rich in nutrients and is a healthy source of animal protein. Rabbits can easily be farmed, given their small size. However, they are also an often consumed type of wild game. 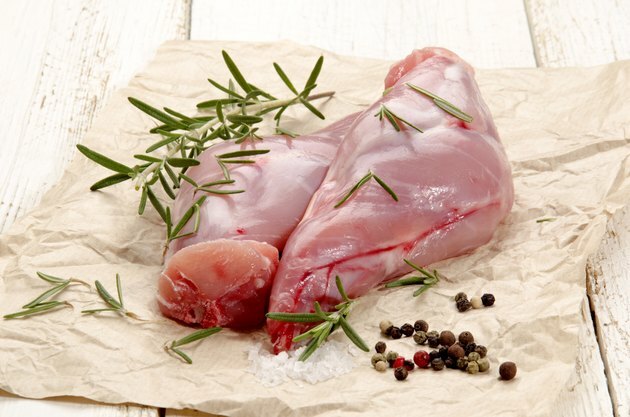 Wild rabbit and domesticated rabbit have some substantial nutritional differences and are also considered to be fairly different in terms of depth of flavor. Domesticated rabbit has a larger variety of vitamins and minerals, making it more nutrient-rich than wild rabbit. However, domesticated and wild rabbit share most of the same nutrients and even contain them in the same amounts. The main exceptions to this are their amounts of iron and selenium. Wild rabbit has twice as much iron as domesticated rabbit, and domesticated rabbit has more than twice the amount of selenium. According to a 2016 article in the Journal of Livestock Science, herbs, spices and botanicals are often added to rabbit feed to improve digestion, prevent illness and provide antioxidants. When rabbits are fed these additives, it increases the amount of antioxidants in their meat, thereby enhancing its nutrition. The fat content of rabbit meat is fairly low in comparison to other proteins, making it a lean meat. In fact, according to the Food and Agriculture Organization of the United Nations, rabbit meat has one of the lowest fat amounts and highest protein amounts of many typically consumed meats. However, the amount of fat in rabbit meat can be substantially different between domesticated and wild rabbits. In every 100 grams (3.5 ounces) of domesticated rabbit, you will find 5.6 grams of fat. Saturated fat makes up 1.7 of these grams. In contrast, there's about half this much fat in wild rabbit. There are 2.3 grams of fat in every 100 grams of wild rabbit, with 0.7 gram supplied by saturated fat. According to a 2013 study in the Journal of Animal Production Advances, this is much less fat than in other widely consumed meats, like pork and beef. Although it is low in fat, rabbit meat is rich in healthy monounsaturated and polyunsaturated fats, like omega fatty acids. There are 220 milligrams of omega-3 fatty acids and 860 milligrams of omega-6 fatty acids in every 100 grams of domesticated rabbit. There is a bit less than half of the amount of these fatty acids in wild rabbit meat, but this number is still fairly high, considering how little fat wild rabbit has in comparison. Although meat from wild rabbits has less fat, it has more cholesterol. There are 81 milligrams of cholesterol in every 100 grams of wild rabbit compared to 57 milligrams in domesticated rabbit. This is still less cholesterol than that contained in other commonly consumed meats. Based on the current Dietary Guidelines for Americans, there is not any limitation on how much dietary cholesterol you can consume. This is because dietary cholesterol is no longer considered to be bad for your health. According to the American Heart Association, it's actually saturated fat and trans fat, rather than dietary cholesterol, that influences the cholesterol levels in your blood. If you're concerned about your cholesterol and you eat rabbit often, you may want to consume more wild rabbit. This is because wild rabbit has less saturated fat, despite its higher cholesterol levels. Rabbit is a game meat that can be easily cooked in a variety of ways. It tastes similar to birds like turkey, pheasant, guinea fowl or chicken. It's also very similar to chicken from a macronutrient perspective. You can cook rabbit meat just as you would cook any other type of lean meat and use its bones to create flavorful stocks. However, be aware that it's a bit easier to cook domesticated rabbit meat than wild rabbit meat. The meat of domesticated rabbit is typically more tender and fatty. It's easiest to cook rabbit meat in wet heat, as part of a pie, stew or casserole. Alternatively, cooking it on low heat over a longer period can also provide you with tender meat, which is particularly suitable if you're planning on roasting your rabbit. You can find rabbit dishes all over the world. It's also used to make a variation of traditional Portuguese sausages known as Alheira as well as Maltese stews, like Stuffat tal-Fenek. Rabbit meat and offal are also regularly consumed in spicy street food dishes throughout northern China. Is Duck Healthy to Eat? Is Crab Meat High in Cholesterol?